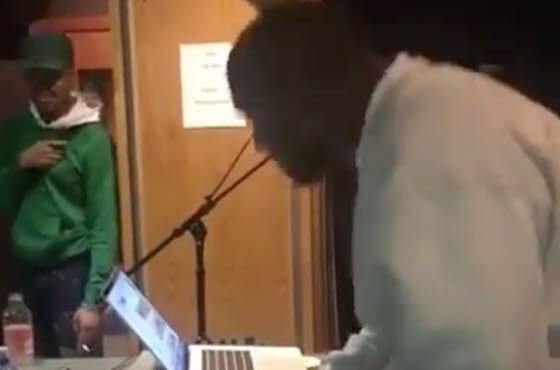 Kanye West shared a photo of himself in the studio in his hometown of Chicago yesterday (August 29), and it turns out Chance the Rapper was there, as well. It's unclear exactly what project the pair are working on, but they did unveil a chopped-up version of the Jackson 5's "Never Can Say Goodbye" in honour of what would have been Michael Jackson's 60th birthday. The soulful sample is undeniably catchy, though in the clip posted we only get to see Chance standing off to the side rather than actually contributing any bars. While we wait to see what the sample turns into, check out a video preview courtesy of West below. West released his latest solo album ye earlier this year, in addition to putting out records with Kid Cudi, Teyana Taylor and Nas. Chance the Rapper, meanwhile, has hinted at his follow-up to Coloring Book and released a block of new songs last month.